Portugal and the Czech Republic were the first teams battling it out for a place on the Euros' semi-finals. Surely enough, we were presented with a more timid approach from both teams, since this was a winner-take-all contest and none of them wanted to leave this soon after getting this far. In these stages of the competition, it is rather obvious that everyone has done their homework and, more often than not, the two elevens try to cancel their opponent's strengths, rather than showing their own. 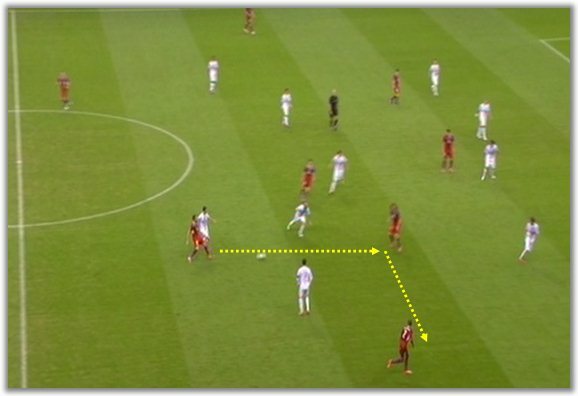 Therefore, the sight of centre-backs hoofing the ball forward was rather unoriginal and not exactly unexpected, given the little space both midfields had to operate in. 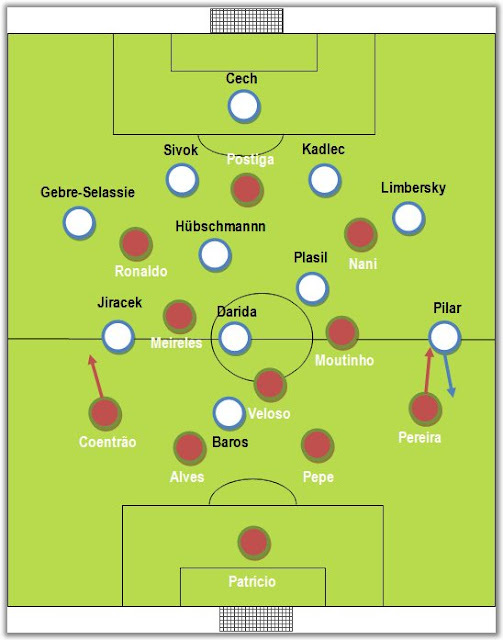 With Dadira deputising for Rosicky (who was not fit enough to start), the Czech manager Michal Bilek tried to pack the centre of the field and make his team narrow, somewhat emulating what he had done against Russia. Paulo Bento responded by bringing both Nani and Ronaldo inside, hoping the full-backs would take the outside routes. Portugal started out poorly and, much like in the match versus Germany, often misplaced (simple) passes, which undermined one the main strengths of the Selecção: the quick transitions into attack. In fact, the Czechs took control of the game for the first 25 minutes, exploiting preferentially the wings, as expected. Meireles tries to close the middle while Selassie pushes forward, unattended by Ronaldo. Because he is trying to cover for his position and Ronaldo's, he is already late. 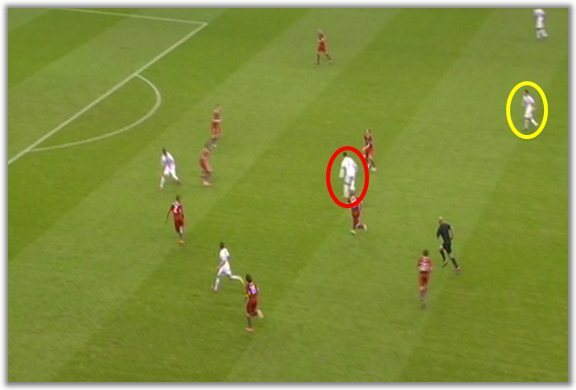 This particular situation often left Coentrão exposed. Both Raúl Meireles and João Moutinho were too wary of leaving their original positions and giving away the midfield battle, a fear that went on until the 25th minute, when Moutinho finally appeared a bit higher up and fed Ronaldo a perfect through ball. Even though the referee ended up blowing the whistle for Ronaldo's foul, it was the wake-up call that the team needed. Moutinho (yellow) finally gets himself higher up and Ronaldo (red) drifts inward. namely when fed a perfect through-ball such as Moutinho's (yellow). It was hard to tell whether Paulo Bento chose to kept Meireles on the left-side of the midfield because that is where he ended the match against Holland or because he was looking to exploit the Gebre-Selessie's possible forward movement. Either way, it meant that Portugal were (only marginally) more dangerous down the left wing, particularly after the 25th minute, where Coentrão started feeling more at ease and motoring up and down the field, with Ronaldo more and more central. Portugal's performance changed dramatically 25 minutes into the game. Bento's instructions and corrections at halftime were clearly spot on. 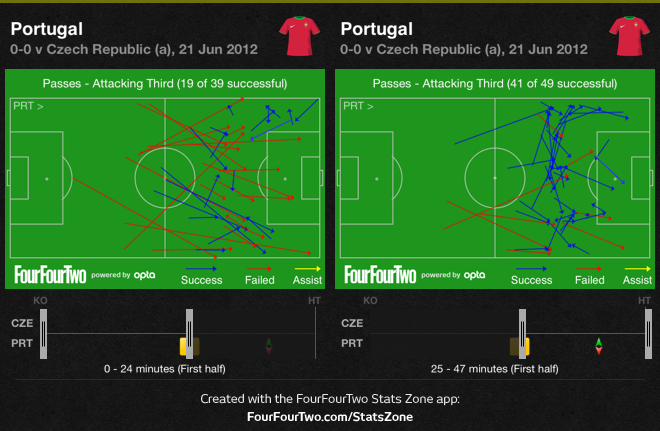 The first play of the second half resembled a Portuguese shot across the bow for the Czechs. In less than 30 seconds, Meireles did what Portugal still hadn't done thus far - something a midfielder is supposed to do in a 4x3x3 (especially if the striker is not that mobile, as is Hugo Almeida's case). 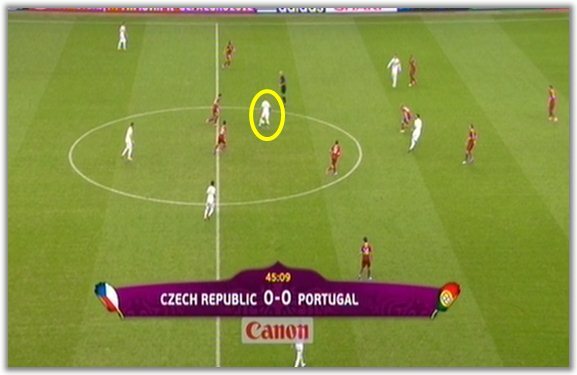 Besides getting the ball between the Czech lines, he then proceeded by taking up the space vacated by Ronaldo, who was already waiting for a possible cross. This play would be a symmetrical replica of Ronaldo's goal. Meireles (yellow) gets the ball between the lines for the first time in this match. 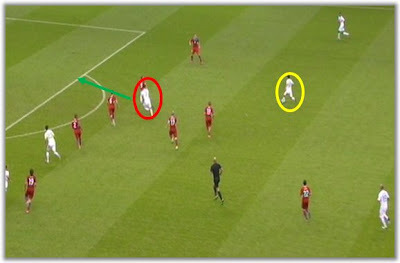 which in turns allows Ronaldo (red) to roam and look for the cross. With the team fired up, every sector of the team was closer, allowing midfielders and defenders to play higher up and collect their opponent's clearances. Even though the Portuguese pressure was not stifling in all fairness, it did wear the Czechs down, to the point where there were actually very few breakaways from Bilak's men. Moutinho and Meireles were finally free from their tactical shackles and started not only shifting the ball from side to side, but also overloading the wings so that Ronaldo and Nani could prove their mettle further inside, where they could be more dangerous. Moutinho's passing chalkboards are a very good example: by the end of the first half, the Porto midfielder had played the fifth most passes. He finished the game atop the passing table, by some distance. 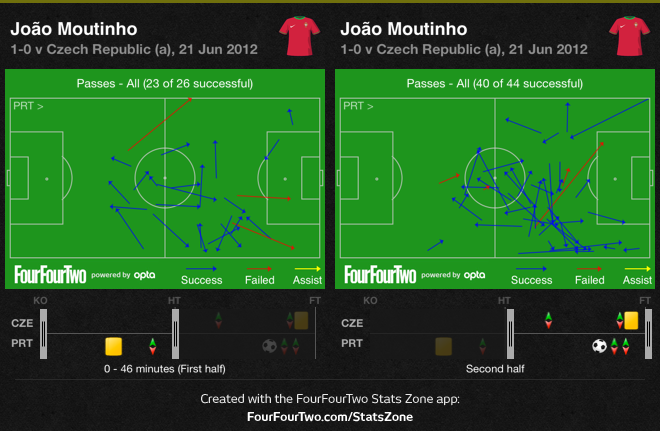 Moutinho was much more active and incisive during the second half. Despite the numerous shots (mostly off target), Portugal weren't being able to finish their opponent off, which could prove costly down the road. With the Czechs worn down and apparently not appreciative of their odds, it seemed the Portuguese goal would be just a matter of time. And indeed, the goal came from the inevitable Ronaldo, eager to make up for his two shots that had previously hit the woodwork. Moutinho penetrated the channel, much like Meireles had done in the first play of the second half, and crossed for an unstoppable header from the Real Madrid forward. Game over.